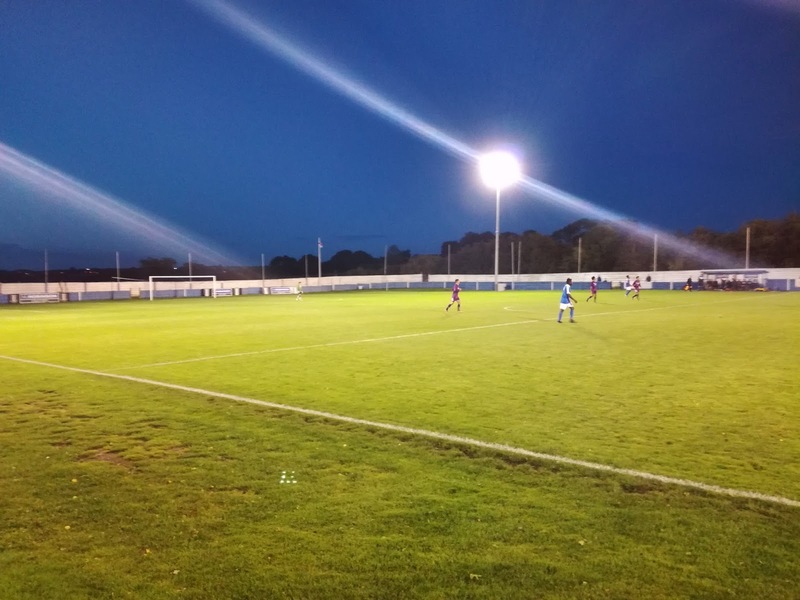 The history of South Normanton Athletic Football Club is a short, yet eventful story. 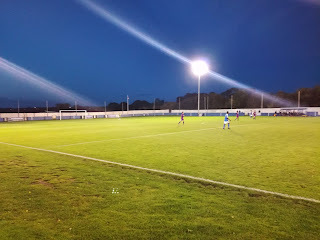 They joined the Central Midlands League in 1990 and worked their way through the divisions until 2003 when they were eventually promoted to the Northern Counties East League. Upon my return from University in 1994, I started to make the odd trip down to Lees Lane to watch ‘The Shiners’, and part of that was due to the clubs excellent media coverage courtesy of then press officer Kev Miles. Kev worked at the local newspaper as sports editor and his ‘influence’ meant Athletic were always well represented, but not only that, he took immense pride in producing the clubs matchday programme which was an excellent piece of work. The impression you always got was that they were a well run and progressive club, and on top of that they did used to get a fair few watching them. 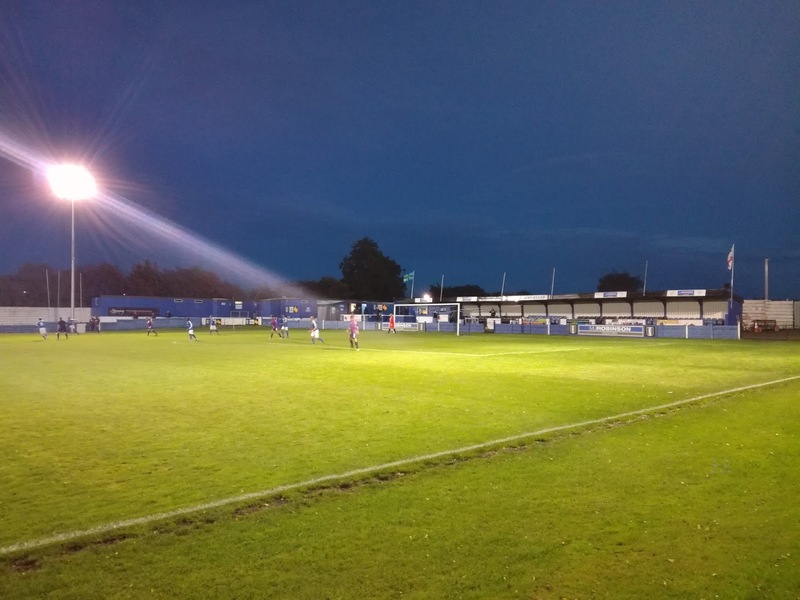 They spent four seasons in the First Division of the NCE before winning promotion to the Premier Division, and that level of football was quite an achievement for a club that had only been playing in senior football for just over fifteen years. After just one season at Step 5, the club resigned from the league, a combination of factors meant the dream was over, or was it? A season was spent in abeyance until a new committee came along and re-started the club back in the Central Midlands League. They remained there for five seasons, pretty successfully, and as a result they won promotion to the East Midlands Counties League in 2014. For three successive seasons they improved their league positon, to a point where they finished runners up last year to West Bridgford. The Nottinghamshire side initially took up their place in the Premier Division of the Midland League, but an internal implosion down by Trent saw them decline promotion, thus opening the door for South Normanton to return to Step 5, nine years after their last season at this level. Throughout the last few years I have tried to make a couple of visits a season to the club, and one thing that always impressed me, and others for that matter, was the importance they placed upon improving their facilities and indeed the customer experience. 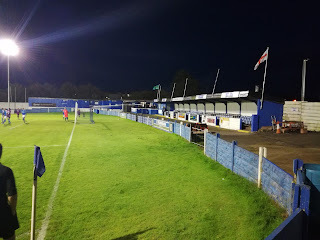 Lees Lane is a very tidy football ground. 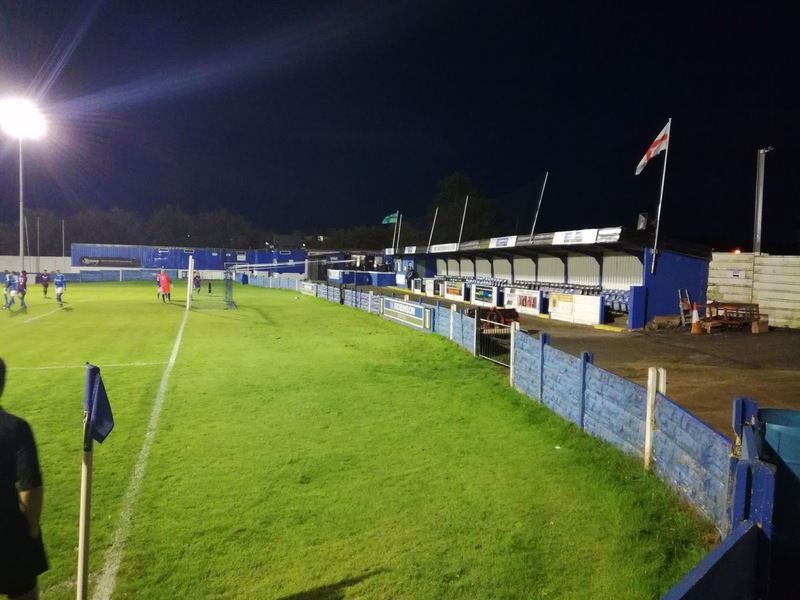 A large car park leads to the turnstiles which nestle in the corner of the ground, usually Chairman Phil Bailey can be spied collecting the admission. Up to the left is the tea bar and the clubhouse, while straight in front of you is the seated stand that’s positioned behind the goal. Built into the stand is the Club Shop. 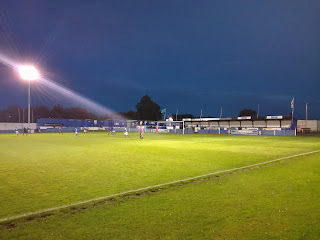 There is a smaller stand placed at an angle by the far corner flag, and then another area of cover runs two thirds of the length of the touchline. The rest of the ground is open, and behind the North goal you have views right across the valley towards Tibshelf. Normanton have had a poor start to the season but a couple of recent good results have seen them start to climb the table, visitors Loughborough University sat bottom of the table with no wins, but, I suspect some of that will be due to the fact that a number of players didn’t arrive at the University until September so they’d been playing a weakened team? A sparse crowd turned up on a chilly night, Lees Lane is quite exposed so even on the nicest of days it can be coat weather! When I say sparse, I would estimate around 75 spectators, and that’s a shame for those who run the club because they deserve better than that, crowds when they were playing at a significantly lower level in the nineties were almost double that. In fact, as myself and Mark from Alfreton observed, of the crowd in attendance, a number were neutrals just looking for a game. It was a very open game and Loughborough belied the fact that they were yet to win a game. They missed a first half penalty, but made amends early in the second half when they took the lead from a scrambled effort. Normanton gaffer Tommy Leighton did his best to rally the troops but they simply couldn’t find an equaliser, despite creating numerous opportunities to have taken something from the game. A draw would probably have been a fair result, but it was not to be. I really hope that Normanton not only survive in this league, but thrive, but they need the backing of the local community to do that. The locals of South Normanton have a great little football club within their midst, they just need to get behind it. 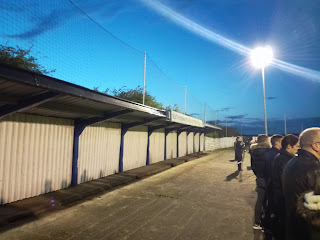 Resurrecting a football club is hard enough to do just the once, to have to do it all again a second time is nigh on impossible, so please don't let that happen to South Normanton Athletic, those that have stood by the club through thick and thin deserve more than that.